As we wrap up the inaugural season of Hike NC!, our hope is that we’ve created a new fleet of hikers in North Carolina. That was our goal going in: to take folks who have been hiking-curious, who’ve wanted to take a walk in the woods but didn’t know quite how to get started, and show them the way. Judging from initial response to the program — this past weekend alone we had more than 120 folks sign up to hike — we suspect we’ve converted more than a few of you. For those of you bitten by the hiking bug, the obvious question: What’s next? 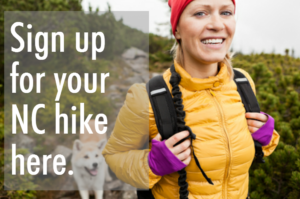 How do you continue to make hiking a healthy habit? Worry not. Just as we’re not of a mind to leave you along on the trail, we aren’t about to ignite your passion, then let you figure out how to nurture it. Here are some options for evolving your hiking career. Hike with others. Hopefully, you’ve gained the confidence to hike on your own. And lord knows a little “me” time in the woods is something we can all use. But hiking with others is good in so many ways. Especially for newcomers, it’s a great way to learn about everything from where to hike, to gear, to the answer to that vexing question, “Just what do you do when you can’t find a ladies room in the woods?” Hiking in a group also helps rekindle the lost art of conversation. Being on the trail makes people drop their guard. You want an honest conversation? Take a hike. Gear up. Another reason to hike with more experienced hikers? You’ll find out the gear they like and what works for them. As you hike longer and farther in varying types of weather, you’ll need the gear that will keep you comfortable/warm/dry/happy. Start your education about gear basics with this gear guide. Explore more trails. We hike to explore, and there’s so much to explore in the region. Just because you’ve hiked the Buckquarter Creek Trail doesn’t mean you know Eno River State Park (like the heart-thumping climb up Cox Mountain, the abandoned waterworks at Pump Station, or the portal passage into the Southern Appalachians — complete with rhododendron, mountain laurel and galax — beneath Occoneechee Mountain). Our major metropolitan areas have a surprising array of diverse trails. Then you head to the mountains … Begin searching for the cool trails nearest you, here. 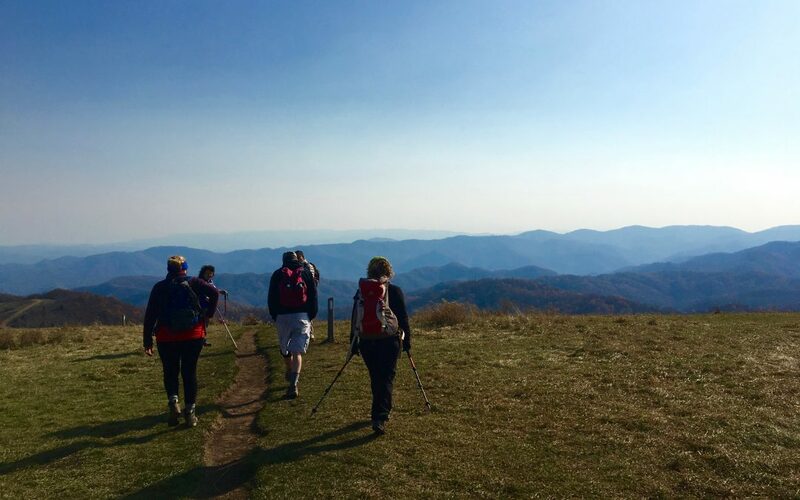 Keep hiking, North Carolina! And remember, we’re here to help.